I’m writing this just moments after I was treated to my afternoon cup of Java by the woman ahead of me in line at the coffee shop. We have never met, and we merely exchanged smiles. She bought, I accepted, I wished her well, and we both smiled again. No, she wasn’t hitting on me – trust me, at my age I know better – but her act of kindness and generosity was a simple and powerful act of leadership. After our interaction, I feel inspired, more engaged with the world, and more likely to act kindly towards other because of what she did. In other words, I feel led. There is leadership in generosity, and kindness, and simple gestures like smiles and handshakes. Kindness helps us to feel safe, and in safety, we can open ourselves to a relationship and be more mindful of what is right and important about the people and the world around us. I believe the spontaneous gesture of kindness is one of humanity’s saving graces. It’s my wife always remembering to kiss me before she goes to sleep, even if she has to come back down the stairs to do so when she forgets. It’s my houseguest sister pouring me the last cup of coffee and then making a new pot for herself. It’s the guy who works the cash register at the downtown sandwich shop who always gives a genuine smile with every order. Maybe it’s you – the boss – remembering for just a moment that your leadership may be experienced more powerfully by others through a quiet thank you or an opened door than it’s experienced in a formal award or even a pay raise. We’re human beings, we need kindness, and we suffer in the lack of it. Giving each other what we need is a powerful and not insignificant form of leadership. Practice it, every day. Also, thanks again, whoever you are, for the coffee. It’s the best cup I’ve had in a very long time. 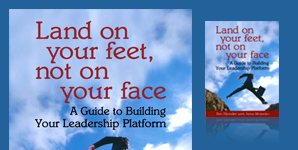 Join our mailing list (you can unsubscribe any time) and we’ll send you a link to a FREE chapter of our book, Land On Your Feet, Not On Your Face: A Guide to Building Your Leadership Platform. Copyright Path Forward. All Rights Reserved.